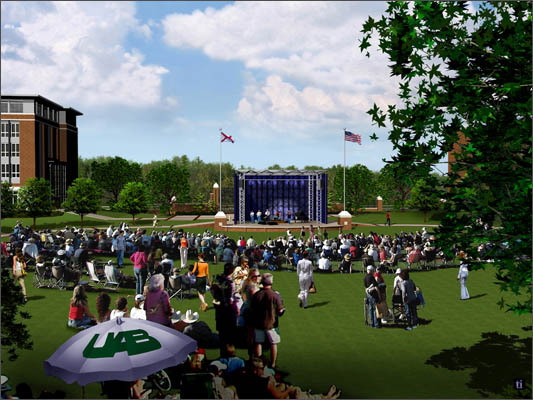 Nimrod Long and Associates was retained by the University of Alabama at Birmingham (UAB) to develop plans for a new quadrangle for the urban campus. Campus Green is an important component in the University’s long-range master plan, defining the quadrangle as “the signature open space and the center of the academic core.” The master plan calls for the creation of a large open space by assembling four city blocks, and the construction of new academic, residential and dining facilities to define the edges. NLA developed the overall quadrangle concept, and created a pattern-book for Campus Green. The concept design addressed gateways, major circulation throughout the space, building placement and architectural guidelines for proposed structures, material selection for hardscape and landscape elements, and guidelines for features such as a bell tower, fountains and other character-defining elements. UAB completed Phase I of the Campus Green construction November 2008.